This is the HyperX Alloy FPS, a mechanical gaming keyboard. It consists of a steel frame, a printed circuit board, a plastic base, 104 Cherry MX Brown switches with red LEDs and the corresponding keycaps. It doesn’t do a lot, but it does what it’s made to do very well. 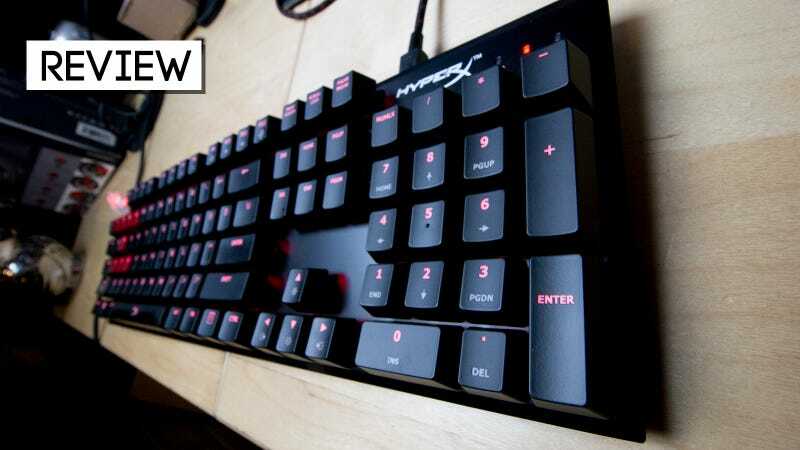 The HyperX Alloy FPS mechanical gaming keyboard from Kingston is a pretty basic board. It doesn’t feature a row of programmable macro keys. It doesn’t sport headphone jacks for audio pass-through. It does feature an additional USB port, but that’s dedicated to charging devices like cell phones and won’t actually connect your mouse to your PC. It does feature a handful of fancy lighting effects, but those effects are limited to several brightness settings of red. It has a special gaming mode, but that’s mainly to disable the Windows key so the menu doesn’t accidentally pop up in the middle of your Overwatch match. What the HyperX Alloy FPS does have is a super-slim profile for easy travel (there’s a padded pouch included in the box). It has a detachable braided cable, which is something mechanical keyboard fans really appreciate. It’s got 100 percent anti-ghosting and N-key rollover, so nary a keystroke goes by unregistered. And it has Cherry MX switches in three flavors—clicky Blue, tactile Brown and smooth Red. The version I am using features the Browns (one of the most popular choices these days). Combined with the steel frame and some nice, solid keycaps, the typing experience is rather lovely. The Frame: One of the coolest features of the Alloy FPS is right there in the name. While many other mechanical keyboards aimed at the gaming crowd go for fancy plastic covers (see last week’s Fnatic Gear Rush review), the Alloy FPS features a solid, fingerprint-resistant steel frame. It gives this skinny keyboard a very solid feel. Plus it reflects the red backlights quite nicely, if you’re into that sort of thing. You Can Take It With You: Though I recently picked up a 40 percent Vortex Core as my traveling companion, it could have just as easily been the HyperX Alloy FPS. Not only is it super skinny and outfitted with its own little travel sleeping bag, the steel frame makes me feel pretty confident about tossing the board into a suitcase without worrying about warping or breakage. Low Profile: I appreciate a keyboard that’s economic with its use of space. The Alloy FPS leaves only about a quarter of an inch along the edges of the frame from the edges of the keys, less space than some of the slimline kit keyboards I’ve played with, while still leaving enough room so the keys won’t snag and pop off easily during transport. The Extras: Just because the board features a minimalist design doesn’t mean it can’t come with a few shiny extras to sweeten the pot. Along with the aforementioned travel case, the Alloy FPS also comes outfitted with the sort of detachable braided cable mechanical keyboard enthusiasts often wind up paying extra for. And not only were the HyperX folks thoughtful enough to include some fancy red WASD and 1-4 replacement keycaps to spruce up the board’s look, they even included a key puller, which shall have an honored spot in the growing pile of key pullers I have amassed over the past couple of months. Seriously, it’s nice to have a little encouragement to experiment included in the box. Not One Of Those Programmable Boards: If you play games that only require the 104 standard keys featured on the Alloy FPS, then great. If you need to set up complex macros or program shortcuts on a hardware level, this is not the keyboard to do that. Like I said, it doesn’t do much, but it does what it was designed to do pretty well. The USB Charging Port: It seems ridiculous to me to include a USB port on the back of your keyboard and not have it function like a standard USB passthrough. The port on the back of the Alloy FPS only charges devices. If I plug in my phone, it begins to charge, but the PC does not see it. This wouldn’t be so bad if the USB cable for the unit wasn’t doubled up to help facilitate this charging functionality. If I am going to use up two USB ports, I would like the option to plug a mouse or game controller into the back of the keyboard. Featuring Cherry MX switches of varying colors, the Alloy FPS can be dressed up with any combination of colorful keycaps on the market. Just keep the LED shine-through in mind when picking your keys, and either plan around it or dim it away to oblivion. I love the HyperX look so much, I didn’t futz about too much. I swapped out the included red keycaps for the WASD and first four number keys, and then swapped out the escape key for a translucent artisan. It’s quite striking. The keycap here is a ProDos from Etsy seller Clackeys, a crafty man whose previous work includes 3D animation for movies and video games. He’s also got an excellent companion cube available, as well as some more risque keys. Excellent work. The HyperX Alloy FPS takes the basic building blocks of a mechanical gaming keyboard, houses them in a sleek steel frame, adds a splash of color and sends them happily on their way. It’s a sturdy little board that’s perfect for tossing into a backpack on your way to a LAN party or computer sleepover or whatever it is you kids do that involves traveling about with keyboards these days. It’s as portable as a full-size keyboard gets without sacrificing the full-size keyboard feel. It probably won’t wind up being your endgame mechanical keyboard, but it’s a nice place to start.